Il profumo va dove “batte il cuore”: poche gocce su polsi, collo e nell’incavo dei gomiti, dove il calore del sangue, scorrendo, ne ravviva le note odorose. E nessuno mai, più di Maria Luigia, figlia dell'imperatore d'Austria e moglie di Napoleone, deve aver conosciuto questo antico suggerimento. Un lapidario Congresso di Vienna, dopo la sconfitta del consorte, le portò in dote il Ducato di Parma, Piacenza e Guastalla, dove il nobile condottiero le promise di fare ritorno, prima del suo ineluttabile esilio all’Elba, “quando le violette fossero state nuovamente in fiore”.E per rendere la fioritura di quelle violette senza fine, decise di sovvenzionare, a solitari monaci del suo Ducato, i primi studi per trasformare il suo fiore preferito in un profumo dall’allure regale: la Violetta di Parma. Una composizione nobile ed antica ma anche così fresca e moderna, 100% made in Italy. Scent goes where "the heart beats": a few drops on wrists and neck in the crook of the elbow, where the heat of the blood flowing revives the fragrant notes. No one as much as Marie Louise, daughter of the Emperor of Austria and wife of Napoleon, must have known this old suggestion. A lapidary Congress of Vienna after the defeat of her husband gave her in dowry the Duchy of Parma, Piacenza and Guastalla, to where the noble leader promised to return before his inevitable exile on Elba, "before the violets are again in bloom ". 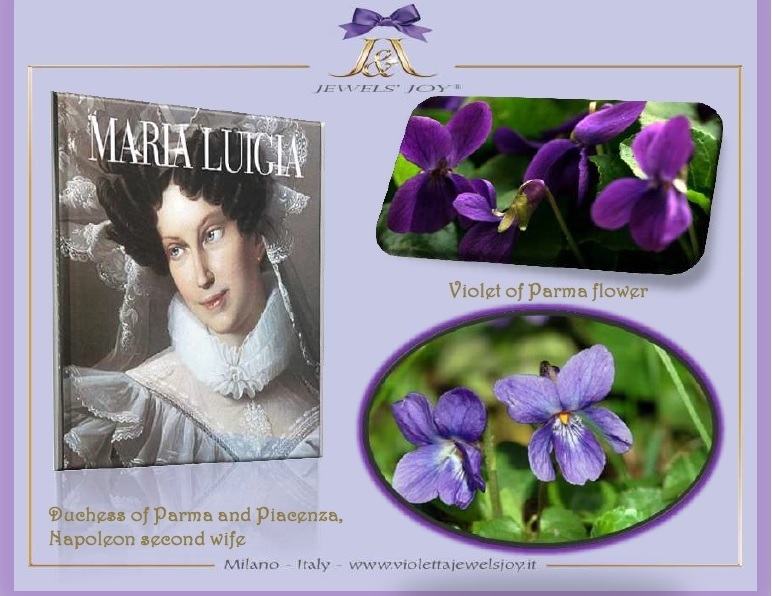 To make those violets bloom without end, the Duchess requested that the monks of a nearby monastery should study how to transform her favorite flower into a regal allure: the Parma Violets. 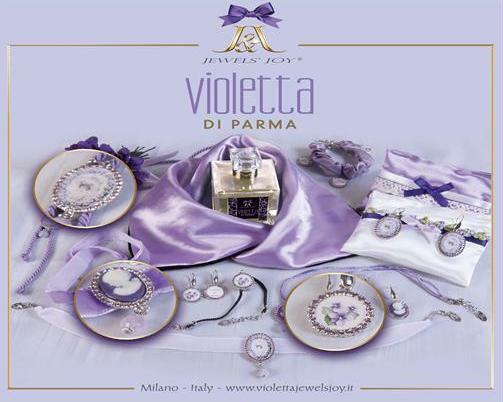 Jewels' Joy ® on matching gems and flowers, has captured the fresh notes of the violet in her first jewelry collection inspired by the flower so much loved by the Duchess Maria Louise. 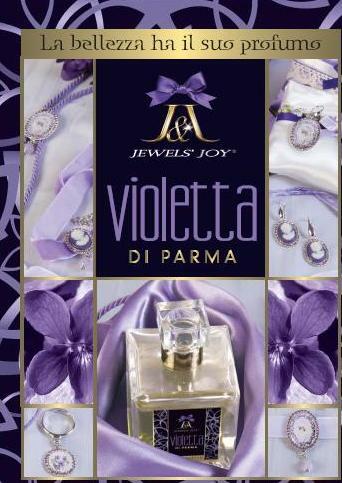 Parma Violets have in fact led us to the first three lines of jewelry coordinated with the Eau de Parfum. Purple is the color of art and imagination, which Jewels' Joy® has translated in parure of cameos framed with precious crystals, retro enamels that flourish under modern crystalline resins and the nuances of soft fabrics to match.